Luscher’s Red Hots: You might know Brian Luscher; chef, charcuterie maven, owner of The Grape. A few years back he moved into a new arena when he devised the Post Oak Red Hot. This snappy and delicious rendition is part of a full line up of dog related bites that includes an oak smoked hot dog made with locally raised meats. Just months ago the chef opened Luscher’s Red Hots in Deep Ellum where you not only can find this delicious example of a hot dog, but also one of the best burgers in Dallas, along with a few other treats that include sausages. 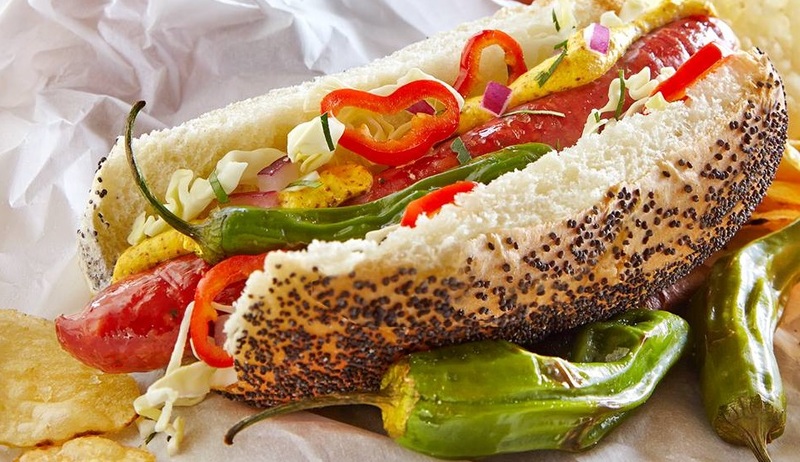 Luscher also has a line of hand-made accouterments to devise your own Chi Dog at home including sport peppers, spicy brown mustard and sweet and hot cucumbers. Hofmann’s Hots: These babies are an East Coast phenomenon that has been made since 1879, but it wasn’t until Phil Romano was involved before it became a retail outlet with the very first location in Trinity Groves in Dallas. 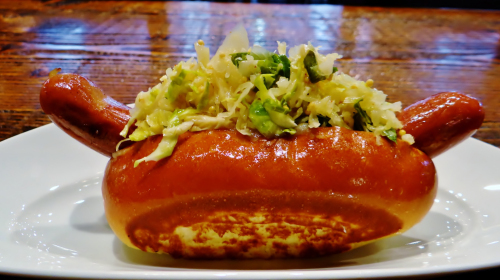 The dogs are custom made with a fresh bun baked in house daily and grilled on each side ala lobster roll. 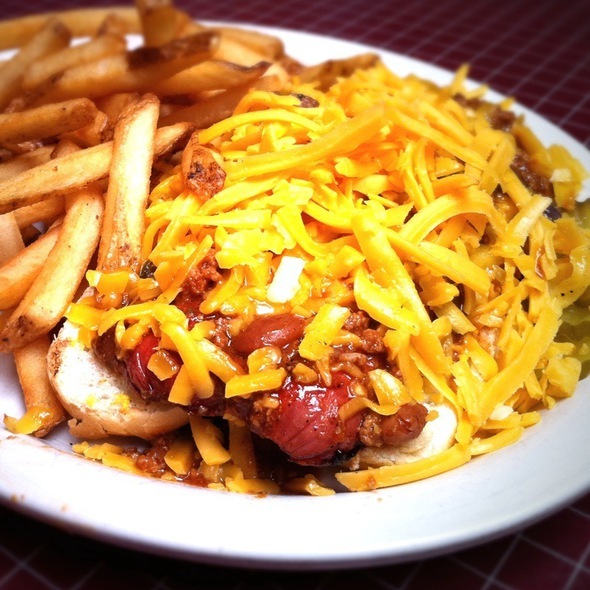 There are loads of ways you might taste your dog, but we like the chili dog which is one of the very best in the city. There is also a kielbasa option for those wanting a spicier wiener. The Ivy Tavern: Besides having a pretty terrific beer selection and a very strong frozen margarita on tap, enjoy the dog at The Ivy Tavern. This bit of happiness on a bun is made with Nathan’s jumbo and topped with pickle relish, onion, mustard, and jalapenos. Make it extra delicious with chili, cheese, and onion and a side of their chili cheese fries. Angry Dog: With the very name of what you sell in your title you must be great, or go home. Angry Dog supplies its patrons with a fat, sloppy mess of a dog replete with plenty of chili and freshly grated cheese. It is one of the best in Dallas and a must for anyone hunting down a dog. 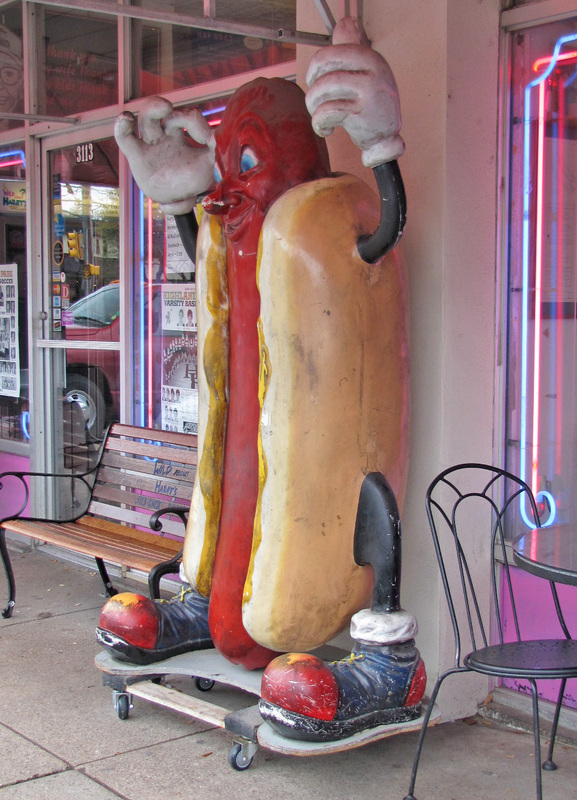 Wild About Harry’s: Besides a fantastic selection of custard, there are in equal amount of dogs to choose from including the New York (spicy mustard, sauerkraut and onions) and the Knox Street (1000 island, sauerkraut , Swiss cheese). Look for a new location opening soon in Deep Ellum. Jerry’s Wood Fired Dogs: Although a chain from California, and the first outpost outside that state, Jerry’s is a custom made dog that has a true bite and snap. 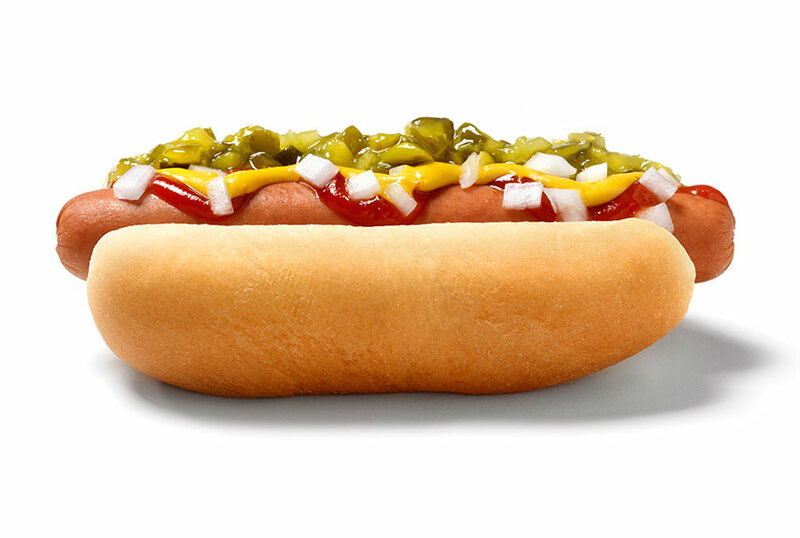 You can order the wood-fired dog to order using dozens of ingredients at no extra charge. The wood makes the difference. Kenny’s Burger Joint: Kenny’s main concentration is his burger, and a damned fine one at that, they also make a delicious dog that can be dressed in a few ways that escalates this dog to more than just a meal, but also a full time commitment that could make your girlfriend jealous. Chili and cheese is requisite. Ballpark at Arlington: The Boomstick is another Woolly Mammoth of a hot dog. Found only at the Ballpark, and their new food truck, this dog breaks all the rules by offering an enormous dog made by Ranger god, Nolan Ryan himself. Named after the bat used by Texas Rangers slugger Nelson Cruz, the $26 Boomstick is a 2-foot all-beef hot dog, smothered in chili, nacho cheese, jalapenos and caramelized onions, all on top of a massive potato bun. The whole thing weighs in at 3 pounds. 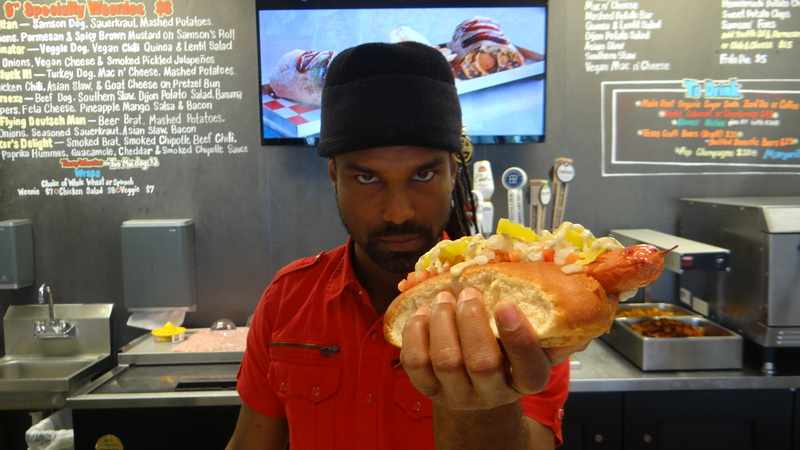 Twisted Root: A local chain that serves up an incredible dog. We might even appreciate the hot dog more than the burgers which they are bets known for in Dallas. The dogs come loaded with more ingredients than you might actually need, and we love when they opt to bacon wrap a dog just before they are given a deep fried treatment. Bowl and Barrel: The menu at Bowl and Barrel escapes most critics in Dallas, but we can assure you that it is well worth chewing your way through. The dog is especially wonderful, and is actually a custom made version made locally from Rudolph’s Meat Market in Deep Ellum. The dog is insane, and barks with a vicious bite to match. Big, meaty and snappy, just what your mother warned you about. Samson’s Gourmet Dog’s: In addition to the delicious dogs with a huge bite, Samson’s also offer salads and wraps. Samson’s opens early to offer up breakfast wraps, and one particularly fine banana bread pudding that is oozing in goodness. Check out all the dogs here, including one concocted in-house for our vegan friends. Look for the Samson’s Food Truck! Pints and Quarts: The latest rendition of the burger and dog in Dallas, Pints and Quarts rounds off our dog list with a version that is sliced down the middle then seared on a piping hot flat top. The chili dog is well worth the order, but we found the Banh Mi dog particularly delicious with its dressed up curls of cucumber, pickled daikon, cilantro, Serrano peppers and a “banh mi sauce”. The potato bread bun is a nice touch. Tallywackers: The oddest dog on our menu today is from a new restaurant on Lemmon that caters to bachelorettes, gay men and well, anyone wanting a large wiener with a side of scandalously clad gentlemen. Get past the school yard humor of which Tallywackers was born, and you will actually find a pretty damned good, if not massive hot dog. Must agree with Hoffman Hot’s. Not on my list either.